Prom season is here, and wedding season is coming soon. You can put some spice into the occasion and still look drop-dead gorgeous by dressing as a TARDIS. Sure, the Time And Relative Dimension In Space vehicle is boxy, and is often mistaken for a British police call box. But that doesn't stop creative Doctor Who fans from making it into something beautiful and alluring. Sasha Trabane, Jax Adele, and Andy Coyle converted Sasha's plain blue prom gown from a few years back into something special by making it a TARDIS. The flap in the front became a door to the TARDIS, which you know is bigger on the inside. Coyle painted the sci-fi interior on canvas, which is revealed when you open the door. 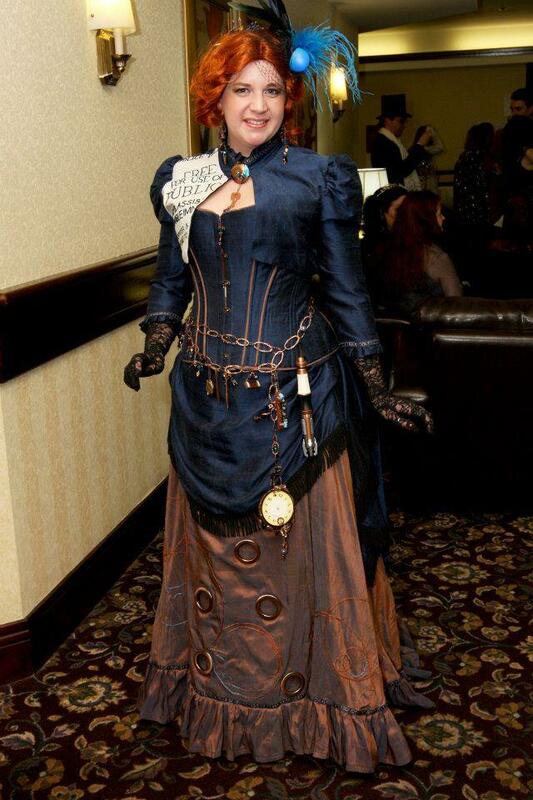 The dress is nice without the interior, but with it, it was a sensation at the Arisia convention in Boston. Sasha's dress has its own Facebook page. 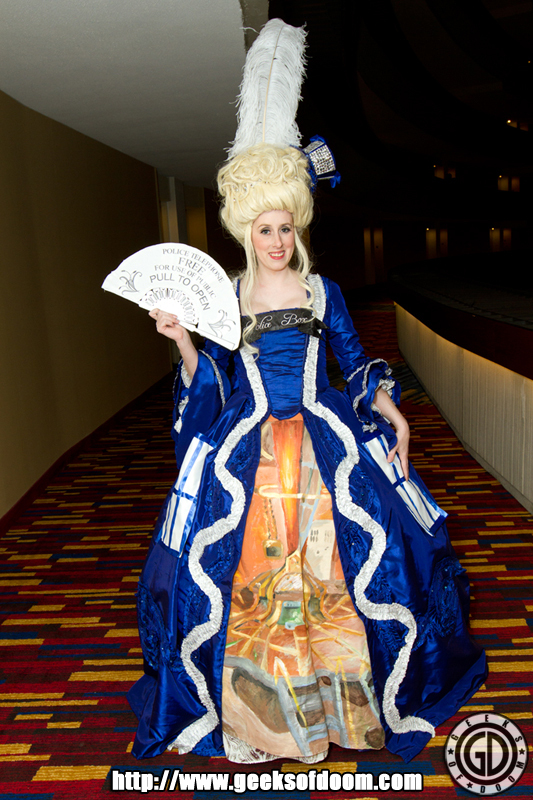 Master cosplayer Kelldar constructed a Marie Antoinette-style TARDIS dress for Dragon*con 2011. She told Geeks of Doom that it was inspired by the color of the fabric, which arrived somewhat wrong for the Marie Antionette costume she had in mind, but just perfect for a TARDIS. So she combined the ideas! 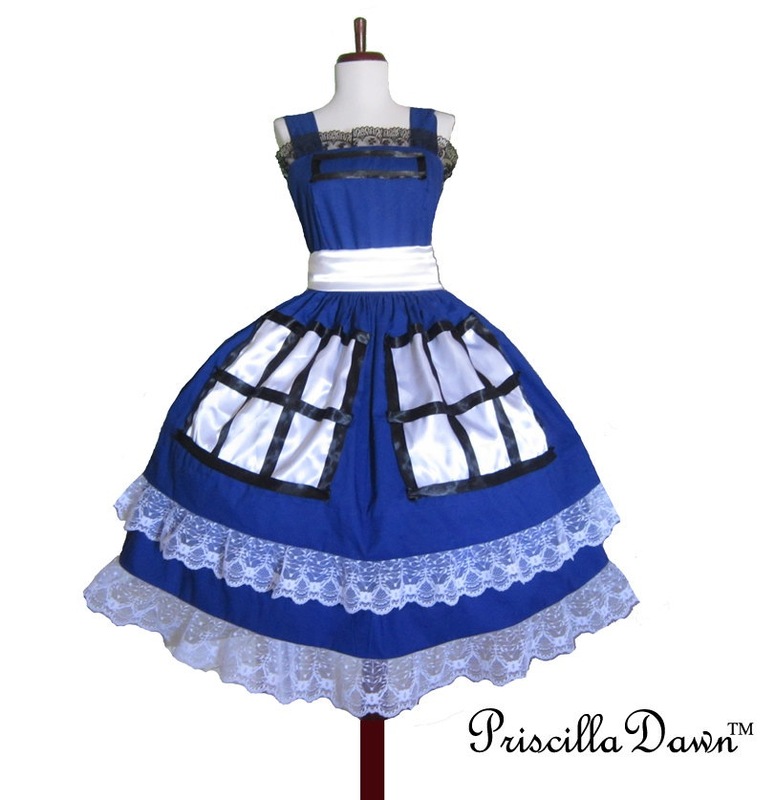 Priscilla Dawn makes a lacy pinafore-style TARDIS dress. The poufy skirt gives it an innocent yet fancy look. Another TARDIS dress is available without the lace. Each is custom-made to fit the customer. 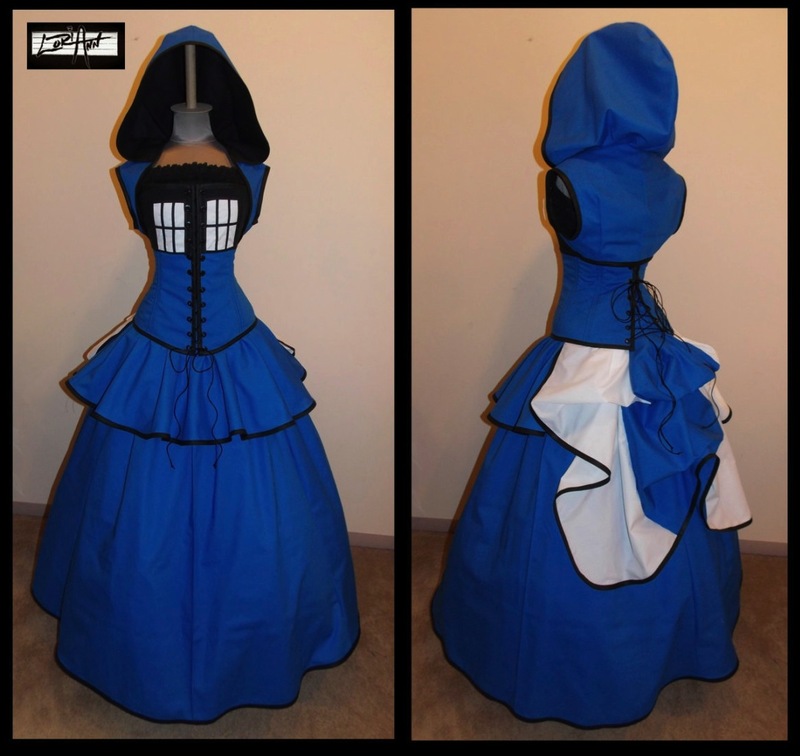 This shorter TARDIS design would fit in seamlessly with other modern prom dresses. Redditor Abcent187 posted it from a friend's Facebook page, but neglected to identify the creator. Update: The dress was made from upcycled materials by Battlestar Jillactica, who is modeling the dress. Photograph by Rigel Bowen. 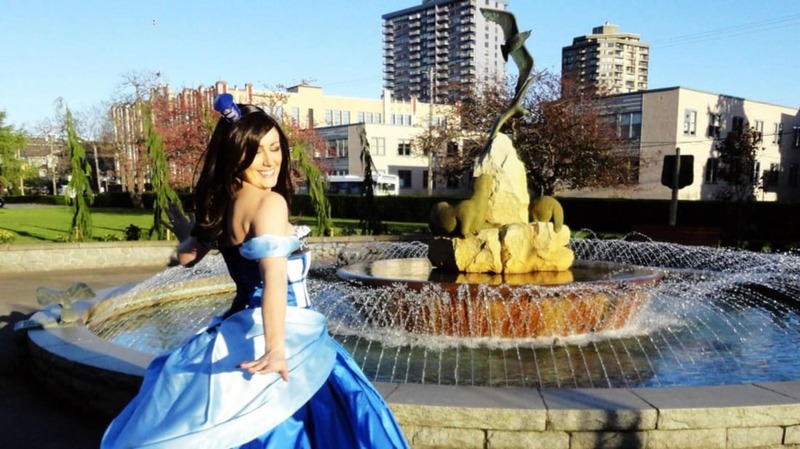 Crystal M made this beautiful TARDIS ball gown out of 10 meters of satin, plus crinoline, netting, and 1500 rhinestones. And then there's the cute little TARDIS hat! 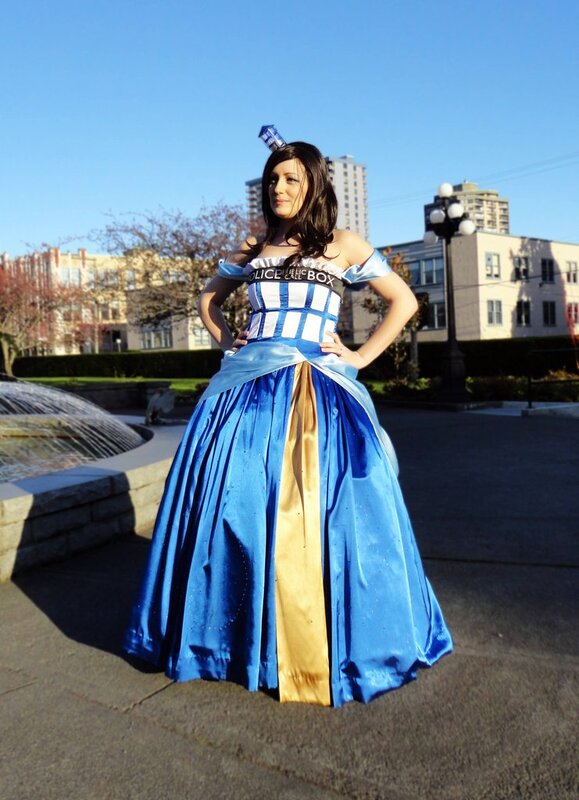 She will wear the dress tomorrow to the Vancouver Fan Expo, then she may sell it to another Doctor Who fan. See more pictures here. From LoriAnn Costume Designs, this old-fashioned TARDIS costume comes in six pieces, and includes a hood, bustle, lace-up corset, and more, so you can mix and match the components to fit the occasion. It's available at LoriAnn's Etsy shop. 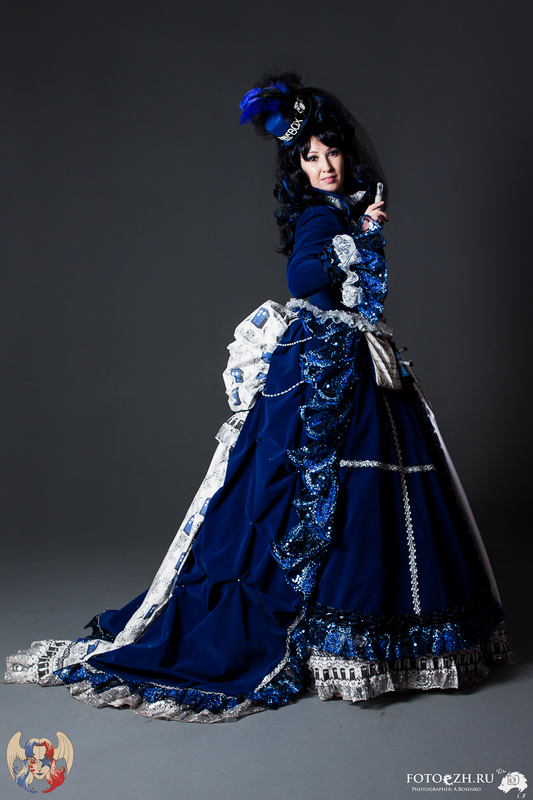 Russian cosplayer and DeviantART member Rimudo-Blanche unveiled this luscious velvet TARDIS gown last month. It is completely handmade with many details, such as a line of TARDIS shapes around the hem, a train made of TARDIS print, and sumptuous lace and beadwork. The matching hat has both feathers and a veil. Rimudo-Blanche models it holding a sonic screwdriver and has a tiny dalek attached to her waist. See more pictures of the dress in her gallery. Let's say you've already got a nice dress, but you need to make it special for a sci-fi or costume event -or you just want to dress it up in your favorite TV show theme. Show your loyalty to Doctor Who by adding a made-to-order TARDIS cincher with skirt over your dress, complete with the proper windows and signs. It's at Corsair's Boutique at Etsy. 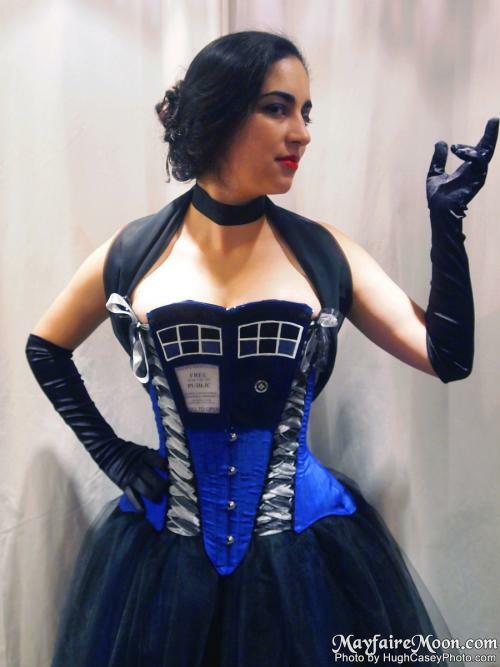 Nikki Cohen of Mayfaire Moon Costumes & Corsets designed and built the TARDIS Corset that not only puts a little kink in your Doctor Who cosplay, but also lights up! Bonus: the "windows" open up to give you a peek at the inside. Relax, that peek is a painted picture of the TARDIS interior. Pair it with a fancy skirt for a fancy dress occasion. Get a closer look with more pictures. Photograph by Hugh Casey. Author JM Frey designed this old-fashioned TARDIS gown and commissioned Kenneth Shelley of Strange Days Costuming to make it. The dress is full of details. The throat-broach has a standard yale key, like the one that the Doctor gave Martha and Jack Harkness, and the belt is hung with small pieces of electronics. There’s a circuit board, knobs and handles, gears, a clock that I dismantled and aged to make it look as if it was falling apart as it dangled from my chains, and of course, a sonic screwdriver. The belt is meant to resemble the control console. 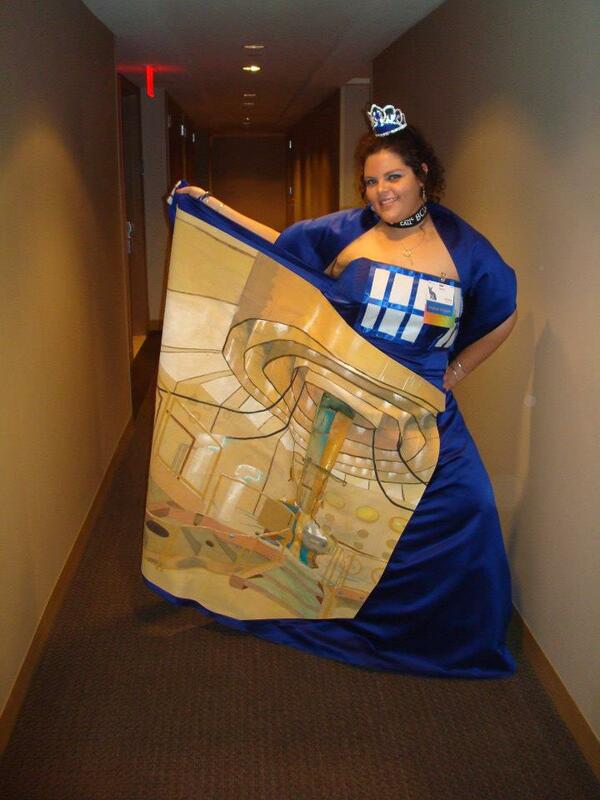 Frey wore the dress to FutureCon 2011-2012, and in a charity calendar. This photograph by Flickr user Ewen Roberts illustrates the variety of designs that Doctor Who fans with a little creativity can come up with. 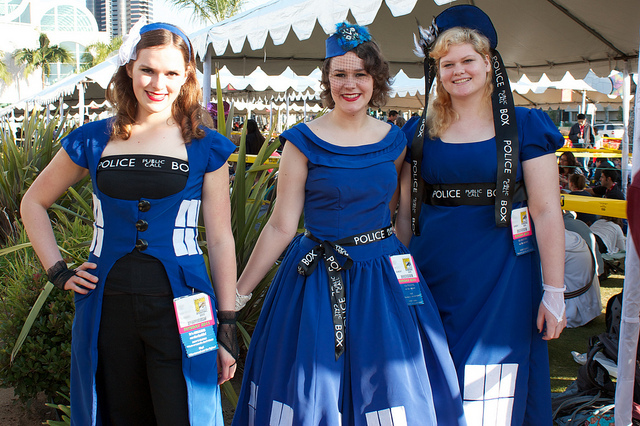 These ladies attended Comic-Con in San Diego in 2011. The only thing their costumes have in common is that they are dresses that remind one of a TARDIS. See also: 11 Functional Homemade TARDISes.